Hatters boss Nathan Jones admitted he would have to sign ‘neanderthals’ if his side had to regularly play on a pitch like the one they did at Stevenage on Saturday. The Luton boss saw Town held to a 1-1 draw at the Lamex Stadium on a terrible surface that prevented either side from being able to show any real quality. If I was going to play on Stevenage’s pitch every week then I probably would recruit neanderthals and from a different planet. 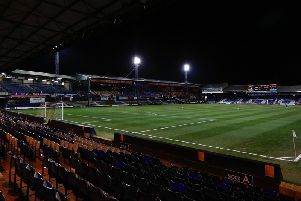 Back at Kenilworth Road last night, Hatters demonstrated once more just what they are capable of on a decent pitch, producing a stellar display against Crawley Town, winning 4-1 in a game where they could easily have replicated their early season thrashings, such was the hosts’ dominance. Speaking afterwards, Jones said: “When you go to Stevenage on an absolute bog, that’s what happens, with the wind swirling everywhere, the pitch was a disgrace. “If you have two teams playing on it, and there’s a few in this league, Coventry, Newport, they have games called off and it’s wrong. “Why are you sharing a pitch in this league? You’re a professional football club. “I don’t like it, you go to Stevenage and that was the leveller and it was that type of game. “It was a poor game, it was a scrappy game, but of course it was going to be as the pitch is a disgrace. “When you come here and play on a decent pitch, that’s what we do and that’s what we’ve recruited to do. MIdfielder Olly Lee, who grabbed his fifth of the season on Tuesday night was delighted to be back on home turf, as he said: “Last week was hard conditions to play in, it sometimes doesn’t suit us. “But these (against Crawley) are the games you need to win, you need to keep rocking up the points, that’s what we need to do and it was nice to enjoy a game tonight and really kick on. “The Stevenage pitch doesn’t suit us, the wind and the rain and everything that comes with it. Meanwhile, James Justin added: “It was an ugly game at Stevenage wasn’t it.